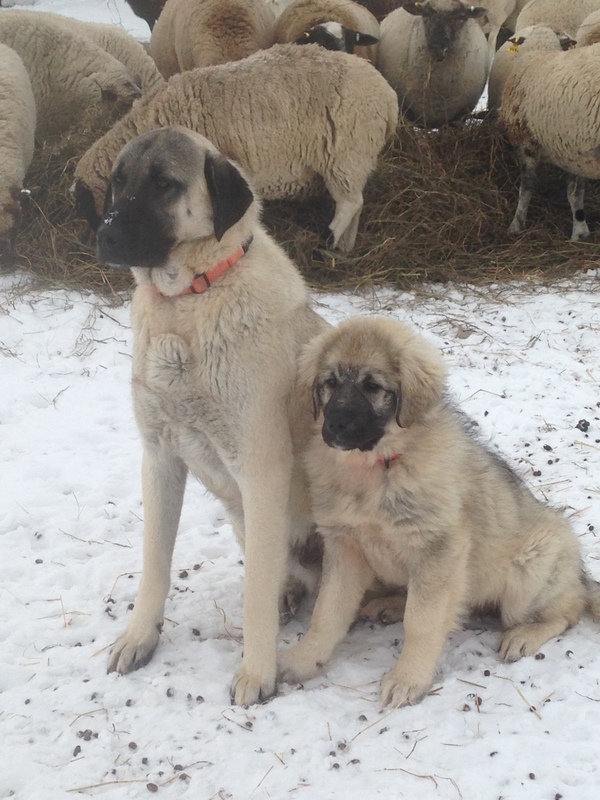 Adventures in Puppy Raising | Loch Lomond Livestock Ltd. In fall of 2014, we decided to purchase a guardian puppy. Although we have had few coyote losses, after rehoming some of the other guard dogs, I felt that one more dog would really solidify the guardian team. (It also helped that a neighbour had a litter of guardian puppies this fall). 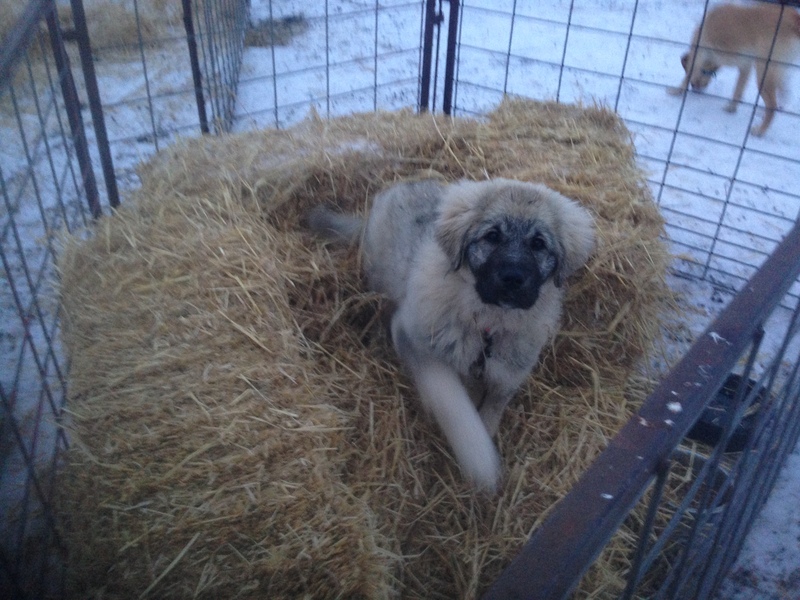 I knew I wanted a female because Thor is such a dominant male, I didn’t want to introduce any fighting issues, so Ruza, a purebred Sarplaninac, came to join the team at the end of October. She has some growing to do to catch up to him! 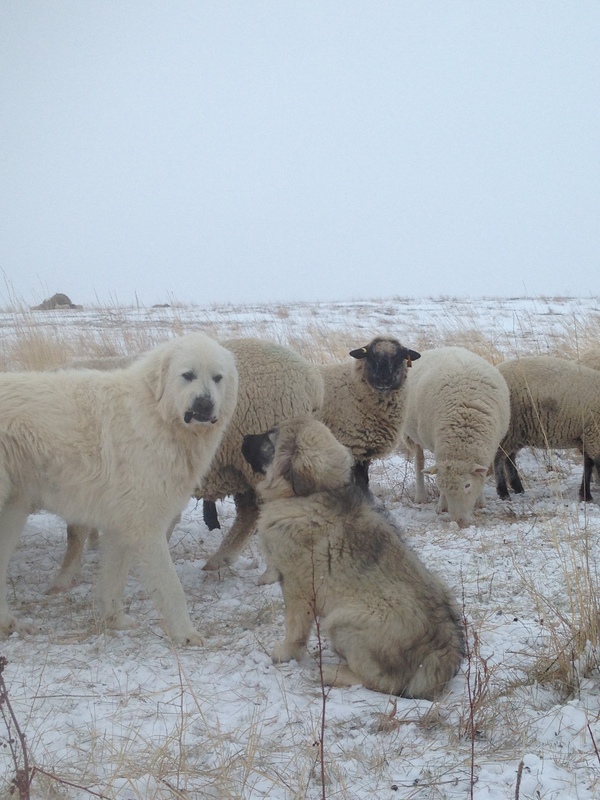 After introductions to the other dogs, I placed Ruza with Alice and the ewe lambs out on pasture. Ruza was born out in the pasture with sheep, so I wanted to keep the transition smooth, and also I didn’t want her to bond with the dogs in the yard. 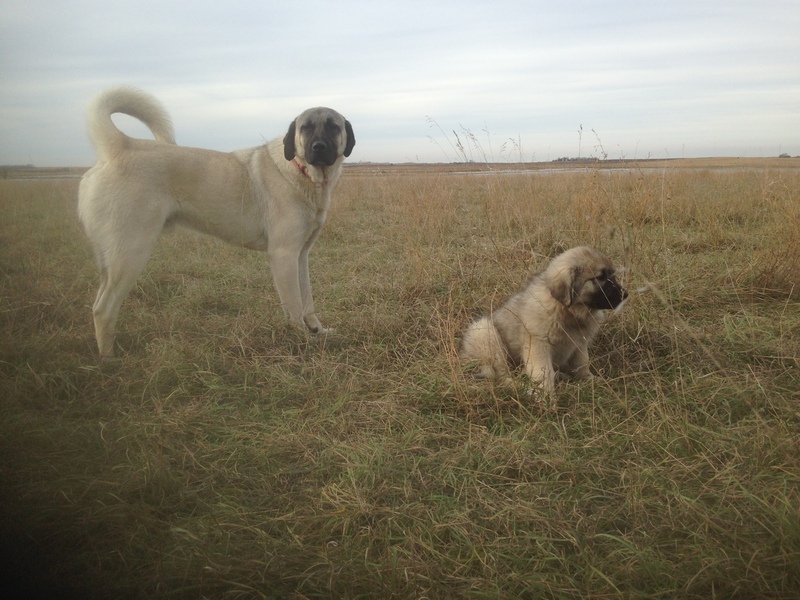 Alice is such a tight flock dog and I hoped that she would teach Ruza some of her habits. I left the kennel there for Ruza to sleep in and so that she had a place to get away from the sheep if she wanted. About 2 weeks later, I noticed Ruza spending a good portion of the days away from the sheep, under some old equipment in the pasture. I expect this was mainly immaturity and because she felt safest near that old piece of equipment but I decided this was a good time to move Ruza into a bonding pen. 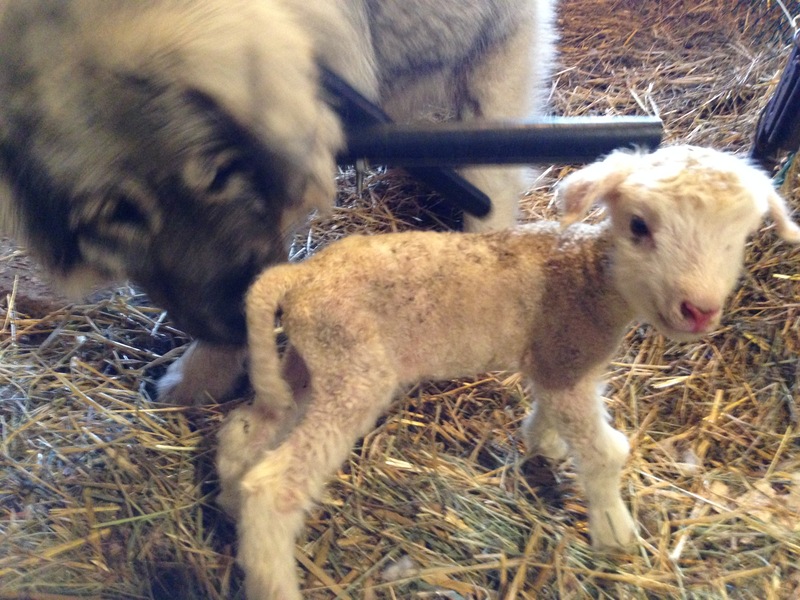 A bonding pen is just a small pen with a few sheep, used to reinforce the dog’s instinct to stay close to the sheep. She also had access to another small pen so again she could get away from the sheep and so that I could feed her away from the sheep. She stayed in this pen for around a month, but then she started to find ways to get out, so I decided it was time for another change. I then took her out to the main flock with Thor and Sam. You can see who she gets along with better! Sam is not into puppy raising. Again, I fixed her up a small pen with some bales for shelter near the ewes’ bedding grounds. She was happy to have Thor to play with, but routinely made her way back into the yard. Sam did this too when he was a young dog, and I think it has a lot to do with a normal pup’s lack of confidence. Whenever she would appear in the yard, I would load her into the back of the side-by-side and take her back out to the sheep. I also tied her to a stake wherever the sheep were eating to encourage her to stay amongst the sheep. I also often tied her at night in the bedding grounds. This had the added benefit of both tie and lead breaking her, so that she understands what a leash is, and she is also ok with riding in the side-by-side, which can be important! We functioned like this for the next month or so, but needed a new plan when the ewes came home. 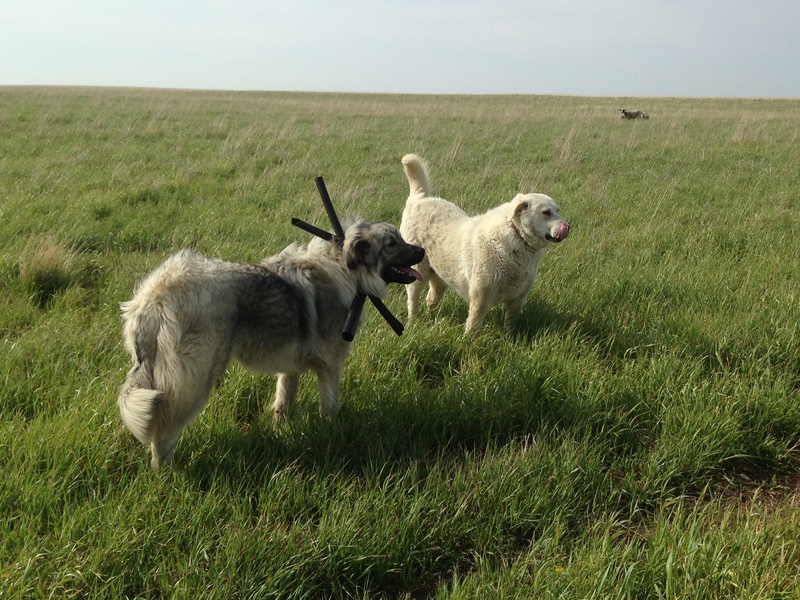 I sorted out all but one ram, as breeding season was all but done, and some lame ewes, and placed Ruza with these sheep without any of the other dogs. I used the pen which has good page wire, and with some extra panels at the gate, made it puppy proof. Thor can jump the fence into this pen and often would come in to play with Ruza or check out what was happening in that pen, but Ruza had to stay when he left. Occaisionally, when I was going to be around the yard, I let her out with the main flock and she would spend the afternoon hanging out with the other dogs and sheep. She was doing well with this pattern, and I eventually left her out more and more. During this time if I caught her hanging around the yard or not with the sheep I would take her back to them. Thor and Ruza seem to be forming a bond, which does not surprise me because he is the youngest dog and so the more playful, as well as the dog that travels between pens. Although I am not surprised by this bond, I am trying not to foster it because it is important that Ruza’s number one bond is to the sheep. After a couple of instances where she has followed Thor through or over a fence, despite wearing a yoke, I decided to split them again, so Ruza is back in the corral with the rams. 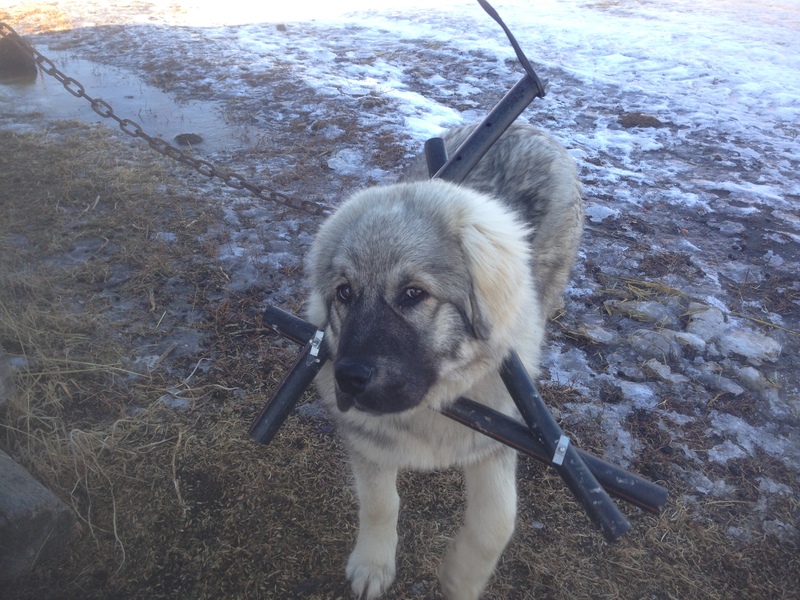 Ruza wearing a yoke made of plastic pipe to prevent her crawling through the fence. This is how we will continue to function for now, trying new situations when the opportunity presents itself, trying to prevent her from forming bad habits and encouraging good habits. Lambing is always a tricky time with a young guardian dog. I kept Ruza with Alice with ewes with young lambs and she did quite well but we did have some trouble with her roughing up lambs when they were about a month old. This is pretty common behaviour with young guardian dogs because they are playful and lambs don’t have the right communication to tell the dog to stop, so they run, which just makes it more fun for the dog. When I discovered this happening, I removed her from those vulnerable lambs and put her back with some older stock at the yard where I could keep a closer eye on her. I returned her to the main flock after some time, but kept a close eye for signs that she was causing trouble. I also discovered that in addition to keeping her from crawling through the fence, the yoke also helped to prevent her from being able to play with lambs. She spent the summer with the other 3 dogs and the main flock. Interestingly, she seemed drawn to Sam – the dog she has spent the least time with and who had no interest in her as a pup. I’m not sure why, but these two would often be together. Sam is a really solid dog, so I have no problem with her picking up some of his habits! We have had another couple of bouts of wool pulling by her this fall – in each case it has been a ewe that has been sick, and removing the vulnerable animal and putting on her yoke it has seemed to stop the behaviour. She is now with her own flock of sheep – a small group of feeder lambs in a small pasture, only about 20 acres, and has been successful at keeping them all safe from coyotes. I think she does miss the other dogs but it’s important that she is able to work on her own. Wool pulling showed up again during the late fall and winter, so I put Ruza on a zip line. A zip line works well because the dog can remain in the pen with the sheep and can have contact with them but if the sheep wants to get away it just has to move further from the zip line. It also gives the dog more opportunity to exercise than tying or kennelling. After a few weeks I took her back to the ewes, but soon a few tufts of wool started to show up again. At this point I brought Ruza back and put her in with the rams. Rams are not so easy to abuse because they will fight back and are not easily backed down by a dog, so wool pulling is rarely a problem. She spent most of the winter with these guys, and we haven’t had any problems. Nicely done Brooke! I tripped across this today and thoroughly enjoyed reading and seeing the pictures.